This article is about the video game system. For the Battle mode stage in Mario Kart: Double Dash!! of the same name, see Nintendo GameCube (battle course). For the treasure based off the system from Wario World, see List of treasures in Wario World § Pecan Sands. The Nintendo GameCube is a home console system developed by Nintendo, and released in late 2001 as the successor of the Nintendo 64. The console's preproduction codename name was "Project Dolphin" and was originally a console that used cartridges, as noted references appear in games such as Super Mario Sunshine. The Nintendo GameCube has six ports on its front: four controller ports just like the Nintendo 64 and two memory card ports. It has three buttons on top: Open, Reset, and Power. On the bottom are two serial ports and one hi-speed port for add-on expansions. The system uses game discs based on a MiniDVD that are the size of an MP3 disc, and are able to hold up to 1.35 GB (1,459,978,240 bytes), making it the first Nintendo console to use optical discs as the primary storage medium. Unlike its competitors, the PlayStation 2 and the Xbox, the GameCube does not play DVD movies. However, the GameCube's release was accompanied by that of the Panasonic Q; the result of a collaborative project between Nintendo and former rival Panasonic, the Q was capable of playing both GameCube games and DVD movies. It ended up failing due to the price of a Q being noticeably higher than that of a standard GameCube and separate DVD player, and as a result, was never released outside of Japan. The Nintendo GameCube was officially discontinued in 2009 due to the leaving of Hiroshi Yamauchi. It sold about 22 million units during its lifetime. The Nintendo GameCube was released in four colors: Indigo, Black, Orange, and Silver. Indigo is the original color seen in advertisements, the trophy in Super Smash Bros. Melee, and other places. Silver was released after the first three colors. Orange was not available in the United States, but controllers matching its color were. The original version of the Wii, the successor of the Nintendo GameCube, is mostly compatible with Nintendo GameCube hardware and software. Like the Nintendo GameCube the Wii has 4 controller ports and 2 memory card slots which support all controllers, like the dance mat and microphone, though it does not support add-ons that attach to the console. Later revisions of the Wii, such as the Wii Family Edition and Wii Mini, would remove Nintendo GameCube support. The Wii U and Nintendo Switch are also not compatible with any Nintendo GameCube games, but Super Smash Bros. for Wii U and most Nintendo Switch games are compatible with the controllers through a special adapter. 2.4 Mario Kart: Double Dash!! The Nintendo GameCube Controller. The color shown here is indigo. The Nintendo GameCube Controller is the system's standard controller. In addition to the standard buttons seen on the SNES and the control stick, introduced with the Nintendo 64, the Nintendo GameCube is the first Nintendo system to include a second analog stick ( , on the bottom right side of the controller). The controller features an analog trigger on each side of its back and a single small shoulder button on the right. The controller features a built-in rumble motor, carried over from the Nintendo 64's Rumble Pak add-on. With the replacement of the N64's C-buttons with a C-stick, the controller also regains the and buttons that the Nintendo 64 controller didn't have. 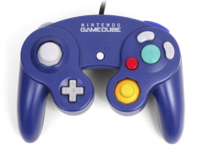 Unlike the Nintendo 64 controller, the Nintendo GameCube controller also has two grips instead of three, which makes it more comfortable for players to use. The directional pad on the Nintendo GameCube Controller has the same size and shape as the original Game Boy Advance. If the player holds during the startup of the console, the cube itself and the tiles will rotate, and the player gains rapid access to the main menu even if there is a disc in the console. Holding down on one controller causes a xylophone to play, followed by a "BOING" and the laughter of a child. Holding down on all four controllers causes a kabuki shout to play, followed by woodblocks, and then a whoop, followed by a triangle's "ding". A wireless variant of the Nintendo GameCube controller known as the WaveBird Wireless Controller is also available. It connects to the system via a radio sensor that plugs into one of the system's controller ports. However, the WaveBird does not support the rumble feature that the standard controllers have. 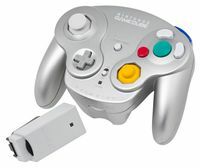 The Nintendo GameCube controller can also be used to play several Wii titles, including Mario Kart Wii and Super Smash Bros. Brawl as well as most Virtual Console titles. In addition, through use of the GameCube Controller Adapter for Wii U, the controller can be used to play Super Smash Bros. for Wii U. The accessory was released alongside an official Super Smash Bros.-themed GameCube controller. As of update 4.0.0, the GameCube Controller Adapter for Wii U and the controller itself can be used on the Nintendo Switch, the latter of which is treated as a Nintendo Switch Pro Controller; unlike on the Wii U, however, the controller can be used in all Switch games. 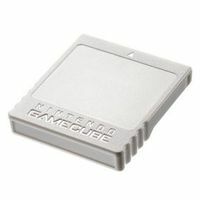 The Nintendo GameCube used proprietary memory cards to save data for games (making the GameCube the first Nintendo console that required memory cards to save game data). Nintendo released three color variants, each of which contain varying block capacities: grey, black, and white, which could each hold 59, 251, and 1019 blocks of game data, respectively. The boxes for GameCube games have memory card holders which can be used to store a memory card in the box along with the game disc. The Nintendo GameCube-Game Boy Advance Link Cable allows for a Game Boy Advance to be connected to the Nintendo GameCube, similar to the Transfer Pak released for the Nintendo 64. The cable can be used in numerous GameCube games to unlock special content, such as Wario World, which utilizes the cable for sending microgames from WarioWare, Inc.: Mega Microgame$! to the Game Boy Advance. The cable is also compatible with the Game Boy Player, with which the Game Boy Advance can be used as a controller for Game Boy Advance games being played on the GameCube. Game Boy Player N/A The GBA can be used as the controller instead of the GameCube controller. Mario Golf: Toadstool Tour Mario Golf: Advance Tour Unlocks new content and transfers game progress. Mario Kart Double Dash!! Bonus Disc Fire Emblem Unlocks exclusive items that can only be obtained from the bonus disc. Also unlocks the soundtracks 99 & 100. The GBA link option is absent in the European version of Fire Emblem, since the Bonus Disc was not released in Europe. Wario World N/A Sends a demo version of WarioWare, Inc.: Mega Microgame$! to the GBA. WarioWare, Inc.: Mega Party Game$! N/A The GBA can be used as the controller instead of the GameCube controller. 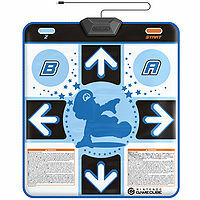 The Nintendo GameCube Action Pad is a dance pad controller released by Konami and packaged with Dance Dance Revolution: Mario Mix, the only game it is compatible with on the system. The pad only features eight buttons: the directional inputs, the and buttons next to the up button, and the and buttons on the top corners of the pad. Two versions of the pad were released. 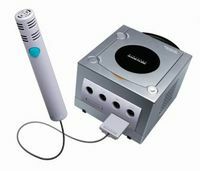 The Nintendo GameCube Microphone is a special accessory used for Nintendo GameCube games on the GameCube or a backwards-compatible Wii. It is unusual in that it is plugged into a Memory Card slot rather than a controller slot. It has been used in Mario Party 6 and Mario Party 7 as a tool for playing mic minigames and making Mic Spaces functional. As the mic was intended to be used specifically with the GameCube, it is not compatible with any Wii games. 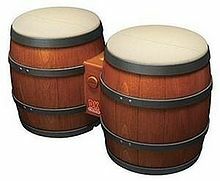 The DK Bongos are bongo-shaped GameCube controllers primarily intended for use with the Donkey Konga series and Donkey Kong Jungle Beat. The controller is symmetrical, and each side is shaped like Barrel with a rubber drum skin fastened on top. It has a Start/Pause button in the center, along with the "DK" logo. DK Bongos even have a built-in microphone to detect clapping (although hitting the sides of it also functions). Each Barrel represents left or right on the GameCube's directional stick, based on how Donkey Kong moves left and right in Donkey Kong Jungle Beat. The DK Bongos are backward-compatible from the GameCube controller ports of the Wii. They are also usable from the GameCube Controller Adapter for the Wii U and Nintendo Switch. In Japan, the controller is called the 「タルコンガ」TaruKonga (or "TaruConga") controller. The name is a multilayered pun, combining taru (the Japanese word for "barrel"), kon, or "con" (a suffix used by Namco when naming their original peripherals, such as the "GunCon", or the "TaTaCon"), and "Konga" (or "Conga"). Before Donkey Kong Barrel Blast's release on the Wii, it was originally developed for the GameCube with the title DK Bongo Blast. It would have been the fifth title to use the DK Bongos (fourth if excluding the Japan-exclusive Donkey Konga 3). The DK Bongos are also incompatible with New Play Control! Donkey Kong Jungle Beat, a port of Jungle Beat on the Wii. The DK Bongos are the main feature of Konga Beat, which is Donkey Kong's Final Smash in Super Smash Bros. Brawl and Super Smash Bros. for Nintendo 3DS and Wii U. 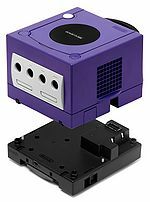 The Nintendo GameCube Broadband Adapter is an add-on that allows players to connect their consoles via a local area network for system-to-system multiplayer. The device connects to the Nintendo GameCube by plugging into the bottom of the system. Only a few games were compatible with the adapter, including Mario Kart: Double Dash!!. The Game Boy Player is an add-on peripheral released in 2003 and allowing players to play Game Boy, Game Boy Color, and Game Boy Advance titles on their television screen through their Nintendo GameCube. The peripheral attaches to the bottom of the system, and requires a special disc in order to play any handheld titles. It is also capable of linking up to Game Boy systems and accessories, including the e-Reader and Game Boy Camera, and players can connect their Game Boy Advance systems to the Nintendo GameCube by use of the Nintendo GameCube - Game Boy Advance Cable to use their systems as a controller, though some games support the rumble feature included with the standard controller. During gameplay, players can bring up a menu with the button that allows them to scroll through various options, including setting the screen size, changing the border surrounding the game, changing the button mapping for a Nintendo GameCube controller, changing the screen filter, and setting a timer. Players can also select to change the cartridge from this menu without turning off the system. The Nintendo GameCube is a trophy in Super Smash Bros. Melee. It also appears as the only platform for Luigi's Target Test, and can be seen in the background of the trophy room along with numerous other Nintendo consoles. Though a Nintendo GameCube doesn't actually appear in Mario Party 4, the Party Cube is a reference to the GameCube, and the rumble machine in the options screen is clearly based on the system. 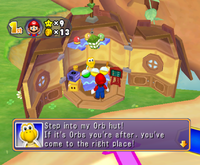 Additionally, a Nintendo GameCube can be seen inside the shops of Mario Party 6 and Mario Party 7. One of Wario's Treasures in Wario World is a Nintendo GameCube. It is located in a pink chest at Pecan Sands. 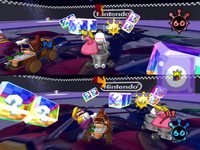 The console as a battle arena in Mario Kart: Double Dash!! The Nintendo GameCube battle course in Mario Kart: Double Dash!! is just a GameCube. This Nintendo GameCube logo can also appear at the bottom of the word "Mario Kart" on the five pointed star in Mario Circuit and Sherbet Land. The logo can also be seen on the billboards at Mushroom City. In Paper Mario: The Thousand-Year Door, Lucky, the brown Bulky Bob-omb that runs the lottery in the west side of Rogueport, will mention the system's internal clock if the player attempts to cheat the lottery by changing the time. 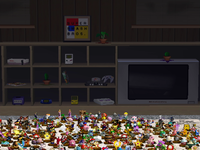 In Super Paper Mario, Francis owns a GameCube which he keeps in his room with several other game systems. In WarioWare: Touched!, one of the falling objects during the credit reel is a Nintendo GameCube logo. In the microgame Game On, a Nintendo GameCube, its controller cable and a game disc can be seen. 9-Volt and 18-Volt play 36-Volt Man on a Nintendo GameCube. In Yoshi's Woolly World, there is a Yoshi design called GameCube Yoshi. 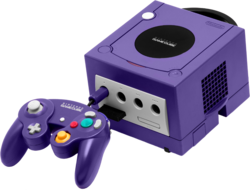 The GameCube is often abbreviated as GCN, although in reality this would be an incorrect abbreviation as it would stand for "GameCube Nintendo". A correct abbreviation would be NGC, which is also the Japanese version of the abbreviation. However, NGC is trademarked by the National Geographic Channel in the United States. It is also close to NGPC, which stands for Neo Geo Pocket Color. These are two possible reasons Nintendo changed the abbreviation for the US market. MPU ("Microprocessor Unit")*: Custom IBM Power PC "Gekko"
System LSI: Custom ATI/Nintendo "Flipper"
Image processing functions: Fog, subpixel anti-aliasing, 8 hardware lights, alpha blending, virtual texture design, multi-texturing, bump mapping, environment mapping, MIP mapping, bilinear filtering, trilinear filtering, anisotropic filtering, real-time hardware texture decompression (S3TC), real-time decompression of display list, HW 3-line deflickering filter. Hardware Nintendo's latest bundle of joy arrived in North America on November 18, 2001, and video-game fans rejoiced. This little beauty is sleek, compact and full of cutting-edge technology. Incorporating optical media for the first time, the Nintendo GameCube was truly born to play. Rumor has it that Super Smash Bros. Melee is a software title for this wondrous device. Nintendo's latest bundle of joy arrived in Europe in May 2002, and video-game fans rejoiced. This little beauty is sleek, compact and full of cutting-edge technology. Incorporating optical media for the first time, the Nintendo GameCube was truly born to play. Rumor has it that Super Smash Bros. Melee is a software title for this wondrous device. The Nintendo GameCube battle course in Mario Kart: Double Dash!! The GameCube menu music is actually a slowed-down version of the Family Computer Disk System startup tone. The GameCube is currently the latest home console to receive an entry of the Mario Golf series. It was the latest console to receive a game in the series, up until the 2014 release of Mario Golf: World Tour for the Nintendo 3DS. The GameCube was the first Nintendo console to not have a Super Mario game as a launch title (excluding the Japanese launch of the Family Computer), as Super Mario Sunshine wasn't released until a year after the system launched. The GameCube's code name "Dolphin" is referenced in many GameCube games, such as Wave Race: Blue Storm and Super Mario Sunshine. The GameCube controller is compatible with more consoles than any other Nintendo controller, being compatible with a total of four: GameCube, Wii, Wii U, and (as of its 4.0.0 update) Nintendo Switch. See here for a complete list of arcade titles and games ported to Atari 2600, Commodore, ColecoVision, Intellivision, etc. This page was last edited on April 18, 2019, at 20:11.